290 pages | 186 B/W Illus. Interactive Graphics for Data Analysis: Principles and Examples discusses exploratory data analysis (EDA) and how interactive graphical methods can help gain insights as well as generate new questions and hypotheses from datasets. 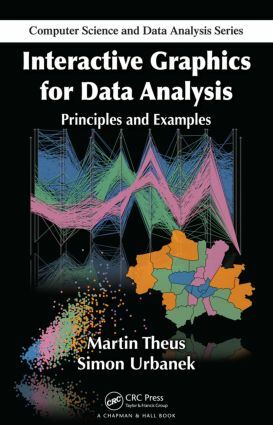 The first part of the book summarizes principles and methodology, demonstrating how the different graphical representations of variables of a dataset are effectively used in an interactive setting. The authors introduce the most important plots and their interactive controls. They also examine various types of data, relations between variables, and plot ensembles. The second section focuses on nine case studies. Each case study describes the background, lists the main goals of the analysis and the variables in the dataset, shows what further numerical procedures can add to the graphical analysis, and summarizes important findings. Wherever applicable, the authors also provide the numerical analysis for datasets found in Cox and Snell’s landmark book. This full-color text shows that interactive graphical methods complement the traditional statistical toolbox to achieve more complete, easier to understand, and easier to interpret analyses. "…Interactive Graphics for Data Analysis gives you the ideas and tools to visualise, explore and understand all your data. …It … also introduces Mondrian, a powerful, easy-to-use tool that allows you to generate and explore everything shown. … If you have any data to present (or to mark), whether you are a psychologist, physicist, geographer, biologist or historian, whether writing a paper or dissertation, use this book. A brief, powerful book with excellent and clear graphics. … You have no excuse not to use it." "…I was able to get an early copy [of the book] and was impressed enough with its content and format to make both the text and software topics for a series in Dashboard Insight. … Interactive Graphics articulates the approach of exploratory data analysis by emphasizing the fundamentals of interactive statistical graphics. …"